For far too long, the land between Old City and Northern Liberties has been underutilized industrial land that has lots of parking spaces and few jobs, but developers are starting to realize the potential for the area as an extension of Old City. The area at the approach to the Ben Franklin Bridge is already seeing new development in recent years. Two new high rise apartment buildings, one on Second Street and one on Delaware Avenue, are finishing up and are beginning to make the once industrial area much more residential. Now, two more high rise apartment towers are planned for a large site on Callowhill Street, between 3rd and 4th Streets, that is adjacent to I-676 and its approach to the Ben Franklin Bridge. These new high rise towers are being designed by prolific architectural firm Cecil Baker Architects, with the landscaping being designed by equally prolific landscape design firm, Studio Bryan Hanes. The developer is unclear at this time, though records show the owner of the property to be Mark Rubin. The site currently has a parking lot and a small industrial building that was converted to an office building years ago. The towers will have a north/south orientation and a four story parking garage between them and a pool and terrace on top. The new west tower will have 26 stories and the new east tower will have 23 stories, with a total of 454 rental apartment units. The developers are receiving a bonus for increased height beyond what the zoning allows, because they are including much open and green space in the complex. Some parking will be underground, but the developers were unable to build all of the parking underground because there is an underground storm sewer under Willow Street. There will be 233 parking spaces for cars; it’s not yet certain how many spaces will be available for bicycles. Next to the east tower, at 3rd and Willow Streets, will be a sizeable public park. There will be retail spaces on 4th Street, and possibly on Callowhill Street if demand warrants. 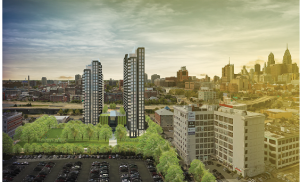 The developers plan to have parking and a “green wall” facing Callowhill Street, for now. The exteriors of the towers will have modern metal panels, large windows, and balconies throughout. The developers plan to make the complex sustainable and will seek LEED Platinum Certification. This development will add to the development along the approach to the Ben Franklin Bridge and finally start redeveloping the underutilized industrial area separating Old City and Northern Liberties. It’s, also, in-between the Delaware River waterfront and the Callowhill/Loft District neighborhood, where they have started to build the long-planned Rail Park on the derelict Reading Viaduct. So, it will help to tie together several important areas of the city.